One of the most frequent patient concerns over dental implants is whether getting dental implants involves any pain. On the whole, most patients report little discomfort or pain involved with the whole procedure. Because a dental implant treatment takes at least three stages to complete, pain will vary at each stage. Pain is typically concentrated in the first two stages of the dental implant procedure than in the last. The amount of pain one feels will vary from person to person, and the complexity of the procedure will determine pain amounts as well. Don't be put off by this, modern innovations in dental technology and practices make all discomfort very manageable. More importantly, these developments make the treatment more than worth the discomfort, especially for the long-term benefits the implants bring. To examine how much pain is typically involved with dental implants, let's discuss what happens at each stage of the dental implant treatment, and the amount of discomfort a strong majority of patients report. the placement of the permanent ceramic teeth onto the previously inserted titanium screws. In the first stage, you are given sedation or local anaesthesia during the dental implant surgery procedure. The area where implants are to be placed will be numbed to any pain whilst the procedure is taking place. After the surgery, though, as the anaesthesia wears off you may notice a slight bit of discomfort. Your dental implant surgeon can prescribe some pain reliever medication to lessen your pain. You can also turn to over-the-counter pain relievers if you feel it's needed. During the surgery a hole is drilled into the jawbone to place the implant of your missing tooth. Post-surgery, as it heals the jawbone will grow around the dental implant, making the implant firm-placed and secure. It is not unusual during this time for you to experience soreness where the implant is being placed, and also in the jawbone around this region. Patients typically report pain in these areas lasting for around a week or so after the surgery. You also might experience pain in your cheeks, chin, or area underneath your eyes, depending on the location of the implant. 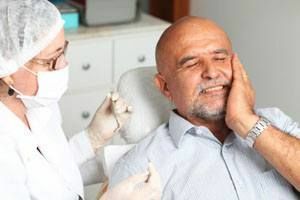 Above all, don't worry-- most patients recognize that the pain involved at this stage is more manageable than that associated with a tooth extraction post-procedure. Depending on the complexity of your procedure, your pain amount might be more pronounced. Expect greater amounts of discomfort if your procedure was more complex than the 'traditional' dental implants placement surgery. Ask your dentist if you have any inquiries or concerns. Additional treatments that needed to be done during the procedure, such as bone grafting to secure firm placement of the implant, also will increase your amount of pain. Don't be afraid to ask your dentist if you feel uncomfortable or think any pain seems abnormal. Side effects may also present themselves during this time. These include the appearance of bruises, swelling, and bleeding. These side effects typically disappear around 7-10 days, though some patients report feeling the discomfort wearing off in the second or third day in that period and then returning halfway through. The most important thing to do during this time is keep the area where the implant is placed free of plaque and food debris. Practicing good oral hygiene daily will provide good protection for the implant area. Don't forget to get lots of rest, either -- that will allow the healing process to take course and progress. Recovery from the third stage of the entirety of a dental implant treatment is where patients typically report the least discomfort. People recover at different time periods, and how each patient responds to the procedure varies from person to person. Pay attention to your body and the area where the implants were placed. Should you still feel any lingering pain after two or three weeks post-surgery, it's recommended that you contact your dentist. Lingering pain can be an indicator of an infection or other issue with the implants. Should you have any other concerns or inquiries, don't hesitate to contact your dentist. Brighton Implant Clinic is an award-winning UK dental implants centre, with three branches in Brighton, Hailsham, and Hove. The centre is founded on the principles of "care, compassion, and credibility." Its dental team has placed tens of thousands of dental implants successfully since its founding in 2009. Please Contact Brighton Implant Clinic for more information and to schedule a free initial consultation or Call us on 0800 111 6623.